The Canon XC15 features a 1″ 12MP CMOS sensor capable of capturing up to Ultra HD 4K resolutions at up to 29.97 fps and 1080p at up to 59.94p, and an integrated f/2.8 – 5.6, 8.9 to 89mm zoom lens, which has a 35mm equivalent focal length of 27.3 to 273mm in video mode. The camera has separate focus and zoom rings and offers auto and manual focus controls. The XC15 supports both CFast and SD cards like the XC15 did. 4K video records to CFast cards in an MXF wrapper at up to 305 Mbps in an H.264-based, IntraFrame, 4:2:2, 8-bit codec; while 1080p video writes to SD cards at up to 50 Mbps in an H.264-based, Long-GOP, 4:2:2, 8-bit codec, also in an MXF wrapper. When got some 4K footage, you may want to start a project with the Canon XC15 4K MXF recordings in iMovie/Final Cut Express or other NLEs on Mac OS X. In this article, we will discuss how to import and edit Canon XC15 4K MXF files in iMovie/FCE without issue. It’s a real pity that we find many users are facing a frustrating result when importing Canon XC15 MXF to iMovie/FCE. The basic reason is that MXF is not a fully supported format by iMovie/FCE. And currently iMovie/FCE still lacks good support for 4K videos. It would be a hurdle to work Canon XC15 4K footage in iMovie/FCE. The realizable workaround to load Canon XC15 4K MXF into iMovie/FCE smoothly is to transcode XC15 MXF to Apple InterMediate Codec for iMovie/FCE. 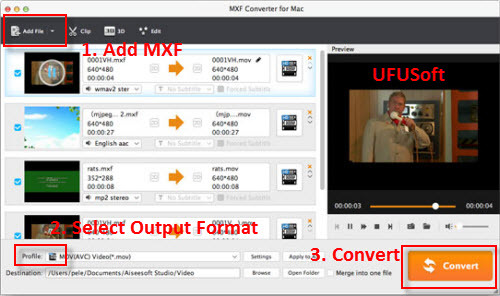 UFUSoft MXF Converter for Mac is best choice to get the work done. It lets you transcode 4K MXF to Apple InterMediate Codec, Apple ProRes, DnxHD, MPEG-2 and more. This is a smart tool specially designed for MXF users to preview and convert 4K, 1080p MXF recordings to your wanted video and audio formats, so as to smoothly add them into iMovie, FCE, FCP, Avid Media Composer, Adobe Premiere Pro to do further editing. Step 1: Import MXF video files from your Canon XC15 to the MXF to iMovie/FCE Converter via “Add” button. Or you can drag&drop the files into the program directly. 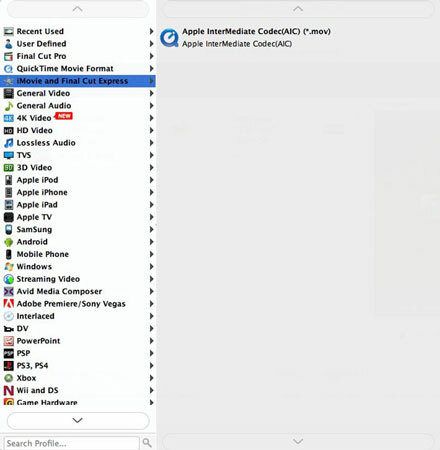 Step 2: Click the Format column to select output format “iMovie and Final Cut Express > Apple Intermediate Codec(AIC) (*.mov)” as the best compatible video format for editing 4K MXF in iMovie/FCE. Tip: Advanced Settings You can click the “Settings” button and customize proper video/audio parameters if necessary. Video size, bitrate and fame rate are flexible and can be adjusted as you like. As far as we know iMovie like many editors use 1080p as primary delivery format, so 1080p would be the best settings. You can downscale 4K to 1080p by adjusting the video resolution. Hit the convert button to start transcoding 4K Canon XC15 MXF to iMovie/FCE on Mac OS X(macOS Sierra, El Capitan, Yosemite included). After the conversion, click Open to get the output videos. Launch iMovie/FCE and start your project.